Goddess Bahuchara is worshipped mainly in Gujarat who desire to have children and also by Hijras, Eunuchs and Gays. What her name, Bahuchara Mata, means is a mystery. Some scholars are of the view that her name means many-behaviors – this because her devotees come from all cross section of the society. She is also the patron goddess of Hijras – men who feel they are women. 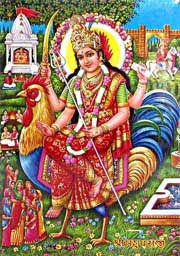 Goddess Bahuchara is usually depicted as having four arms. One of her arms holds a sword, one holds a trishul, one a book and one is in blessing posture. She is beautifully adorned jewelries. Her Vahana or vehicle is a rooster. Legend has it that the Goddess had once turned a woman into a man to help her be the husband of a woman to whom she was accidentally married. There are numerous stories associated with her and many of them involve her changing the sexes of people out of mercy or out of anger. Hijras who castrate themselves are known to pray to her for easy recovery. She is thus popular with transgenders, transexuals, hijras and eunuchs. Sundays and full moon day (Purnima) is special day for Bahuchara Mata devotees. Two largest festivals are held on the full moon days in Chaitra (March - April) and Ashada (June - July). The most famous temple dedicated to Bahuchara Mata is located on the Mehsana Viramgam State Highway No 7 at Bahucharaji town. It is about 110 kilometers northwest of Ahmedabad.